Everything you need to know about fly cutters right here in one complete guide. 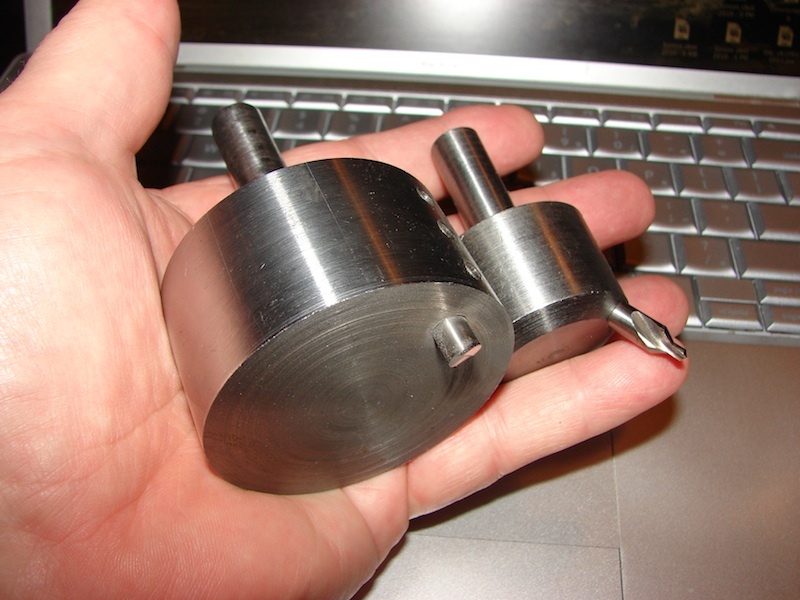 They produce a better surface finish than most Face Mills. They’re inexpensive relative to Face Mills. 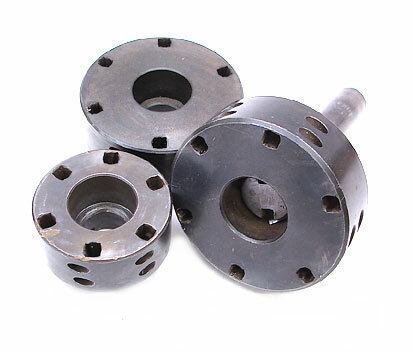 They’re ideal for smaller machines that don’t have the spindle power needed for Face Mills. 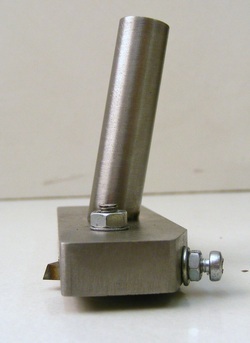 A Fly Cutter is any single point cutter that is used on a mill. The most common fly cutters are used as surfacing tools. 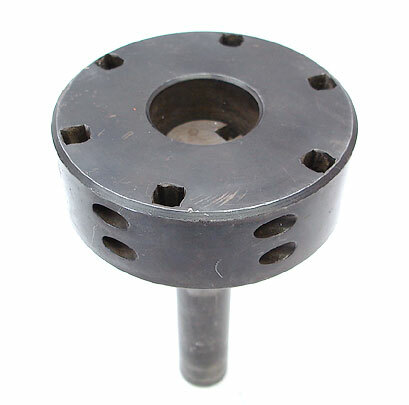 But, you also see single point form tools referred to as fly cutters on mills, for example a form tool being used to create an involute on a gear tooth. 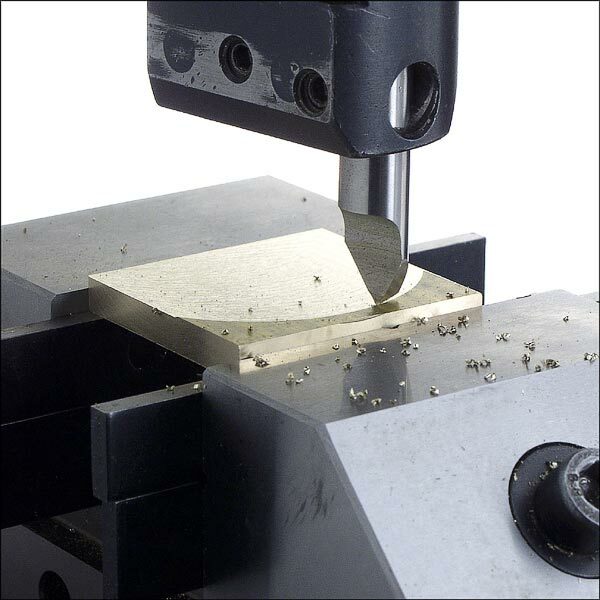 I get asked about Fly Cutters a lot, there is a lot of traffic to CNCCookbook on those keywords, and Fly Cutters are very commonly used by manual machinists. 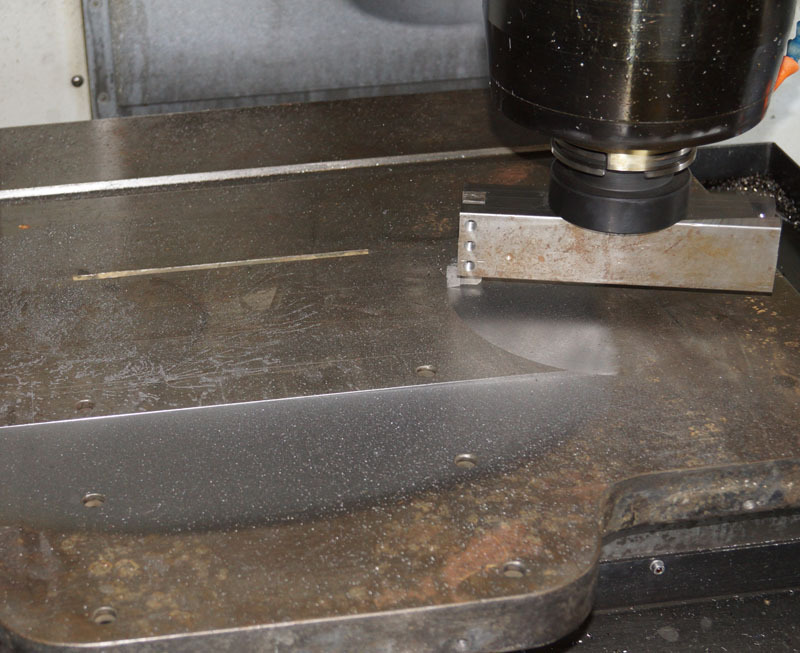 While the CNC crowd will more often prefer facemills, even many CNC machinists realize that a very fine surface finish may be better done by fly cutting. Remove all but one insert from your facemill, and finish improves. 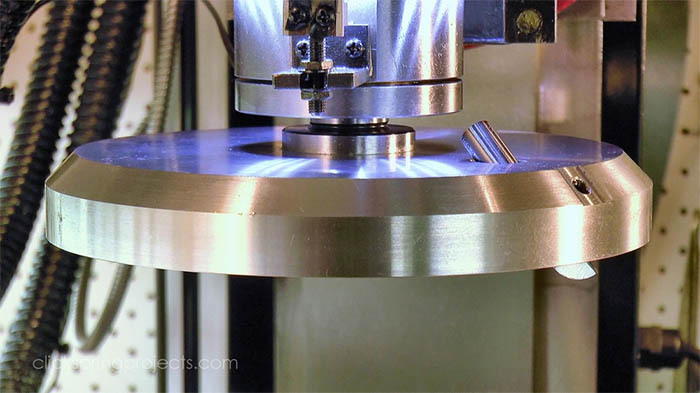 The exception are those most expensive facemills where you can individually adjust the cutting height of each insert to 0.0001″, because that’s what it takes, and that’s why fly cutters can leave a better finish. 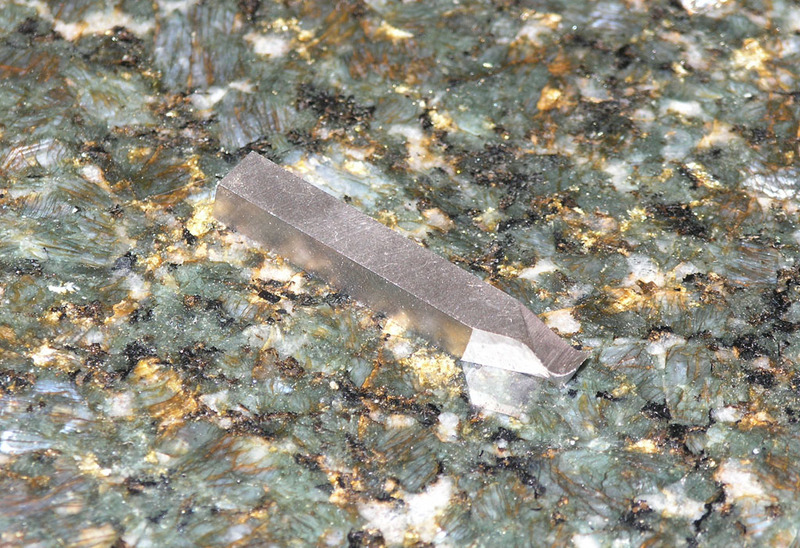 Many say their secret weapon for fine aluminum finishing is a fly cutter with a PCD (diamond) insert. So, for CNC’ers one reason to use a fly cutter is to achieve a fine finish. 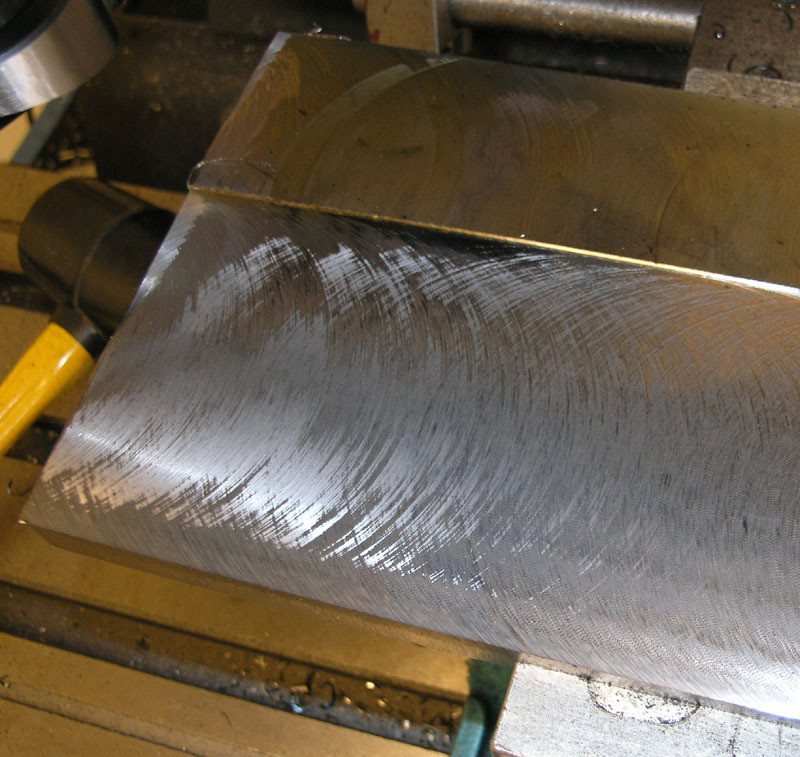 In most cases, the best finish will be one that can be done in a single pass, which implies a large diameter tool and therefore probably not a face mill. David has probably forgotten more about CNC than most people will ever know. If you don’t recognize the name, he is the “D” in FADAL and was one of the original founders of the company. Here’s one more reason to use a fly cutter–it’s a great tool for surfacing your spoilboards on a CNC Router. Typically, you need to take just a little bit off a very large surface area. Running a cutter with a larger diameter helps speed that operation considerably. Flycutters Can Give Better Finish than Face Mills, But Why? You often hear fly cutters can give the best possible finishes (albeit at slower speeds), but why? If you remove all but one cutter from a face mill this converts the facemill to a flycutter which has no runout. 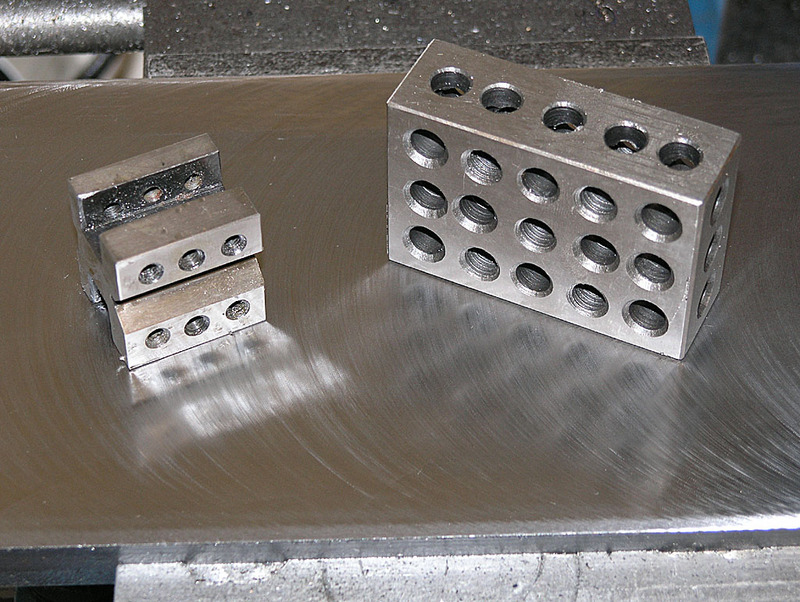 The alternative is a facemill whose individual inserts can each be adjusted for height to eliminate the runout. With facemills that can’t be adjusted for height so they all match, each insert cuts a different chip load and this is what results in imperfections in the surface finish. For Fly Cutter Feeds and Speeds see the Fly Cutter page in our Feeds and Speeds Cookbook. 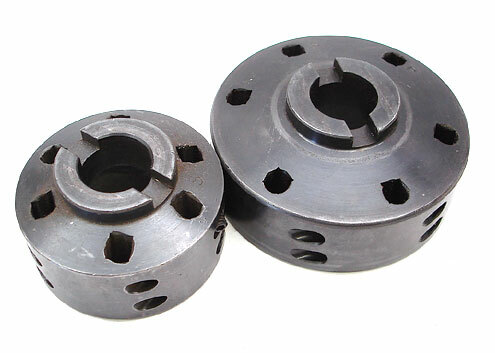 These fly cutters are intended to use a geometry created by just grinding an angle on a piece of HSS round, for example, from another cutter that was broken. There’s no positive rake, but there is clearance from the angle and a big radius so the geometry is not bad. Note: The center drill is just a placeholder and is not being used as a cutter! Why such a big fly cutter? Widgitmaster likes to finish all surfaces in a single pass to improve the finish. 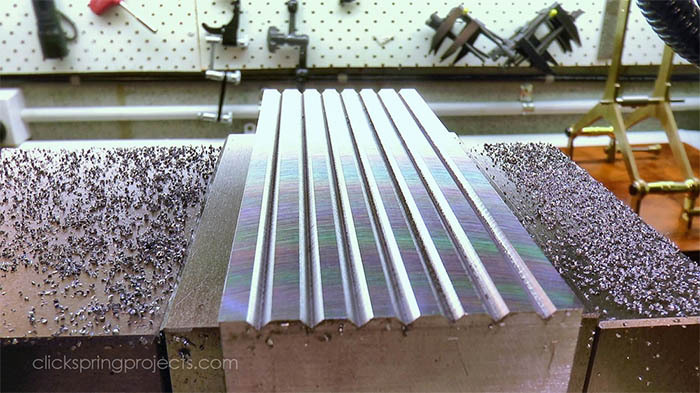 You’ll also see him using really large end mills for the same reason in many cases. He remarks that even though they may chatter, it still gives a better finish than multiple passes. The head was trammed to an angle, special vise jaws go on the outside of the vise, and look at Widgitmaster’s homemade fly cutter! Here are Widgitmaster’s plans to build his fly cutter. I’ve got to try one of these and see how I like the finish. He takes 0.010″ cuts with it. To make the square hole for the tool in the arm he cut it open, slot milled it, Tig welded it back together, and then turned the arm so you couldn’t see the weld. Slick! Note how you can see both sides of the fly cutter cutting. If they’re even, your mill’s head is properly trammed. This one is close, but no cigar! He’s got a hand ground HSS cutter on one end and an insert on the other. I don’t think he means to cut with both at the same time, they’re just options. I like the flat to reduce the chance the bar will slip. 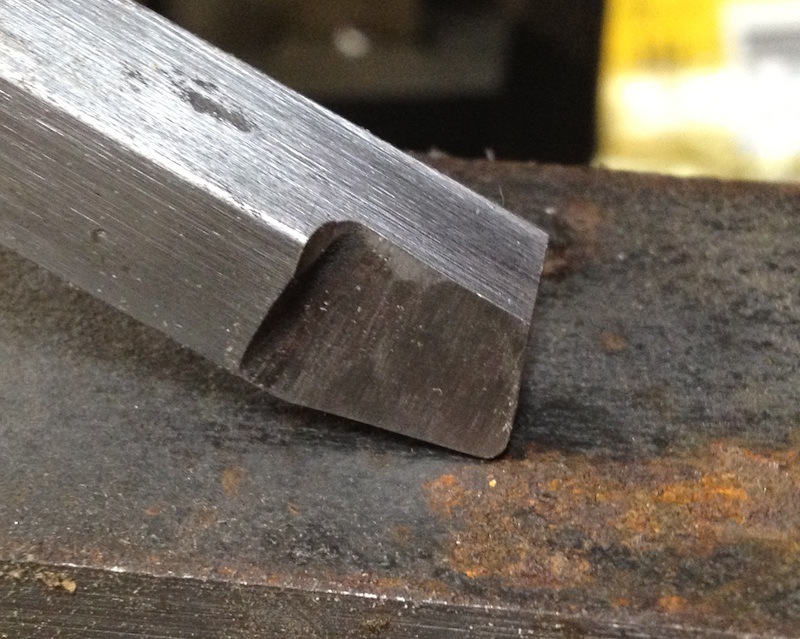 I’d also like to try an insert, but I would likely use TCMT’s based on my experience making a dovetail cutter. Someone on the thread also suggested a set screw or other feature so that if the bar slips it is captured in the hub and won’t go flying across the room. I don’t know how “precision” they are, but they’re interesting. Note how they’re designed to fit a shell mill arbor. It’s a good idea to give them as much support as possible as they have a lot of leverage on the spindle. I like the idea of using a shell mill arbor as opposed to putting a 3/4″ shank on one and trying to stick it into a collet. Not a big fan of multi-cutter fly cutters. If you have more than one cutter in play, you should just use a Face Mill. I’d still want way more radius on the tips than is shown in Mike’s article for the best finish. A couple of thoughts. First, I like the full circle design on these large fly cutters. Keeping the cutter balanced is a good thing, especially if you’re after the ultimate surface finish. I would even go so far as to add a little weight to the side opposite the cutter. It should be easy to determine exactly how much is needed by simple balancing the cutter on a knife edge. 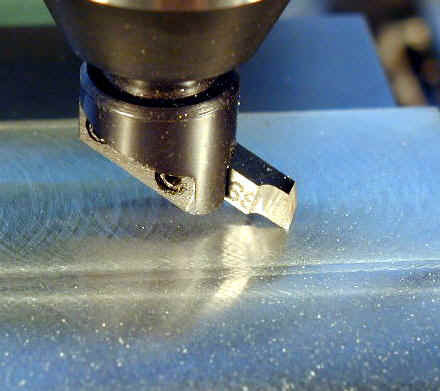 Second, he uses a hand ground HSS cutter. I prefer carbide, and it would be pretty easy to adapt a round insert to a design like this to get a big radius for a nice finish. All toolchangers have a maximum diameter tool they can accomodate. 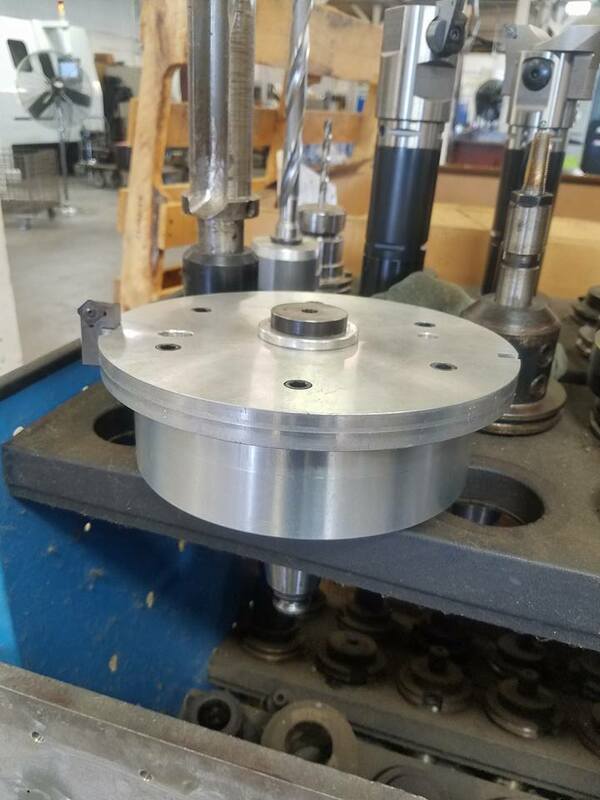 But here’s a trick–if your machine orients the spindle to the same position every toolchange, you may be able to fit a flycutter in a toolchanger that won’t allow a similar diameter shell (multi-insert) mill. 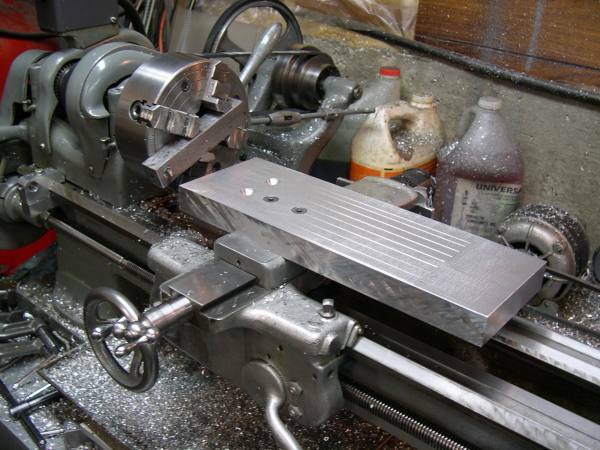 The fly cutter goes in with the arm oriented so it points to the center axis of the toolchanger carousel. 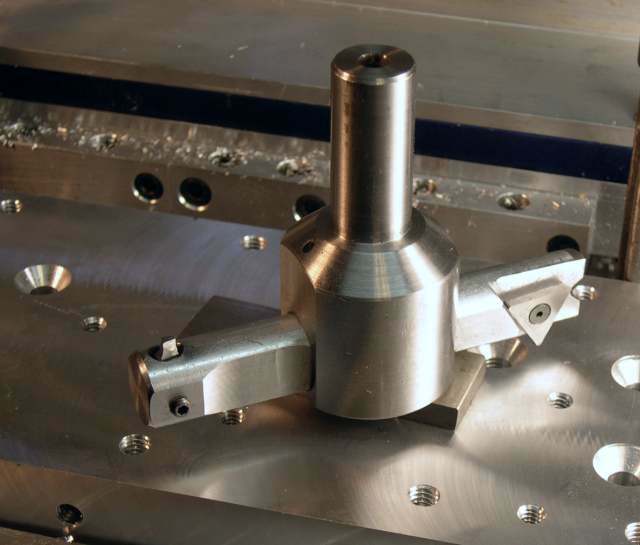 Depending on your machine, that lets it slide in without interfering with adjacent tools. I got a nice note from Steve, a toolmaker in Indiana, who wanted to pass along some valuable fly cutter lore. You’d think the modern facemill had eliminated the need for these simple cutters, but nothing could be further from the truth. That link back there goes to the CNCCookbook page of fly cutter lore, and it’s worth checking out because there are situations where nothing but a fly cutter will help. For the wood saw table top, I got chatter with a tip ground to the geometry you are suggesting. 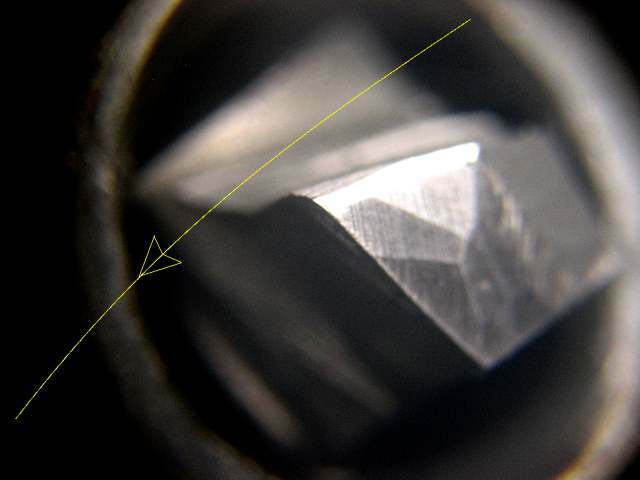 I had to switch to sharpening it a different way, a hook on the top that was a cylindrical groove parallel to the face of the cutter (which in this case was perpendicular to the surface being machined). 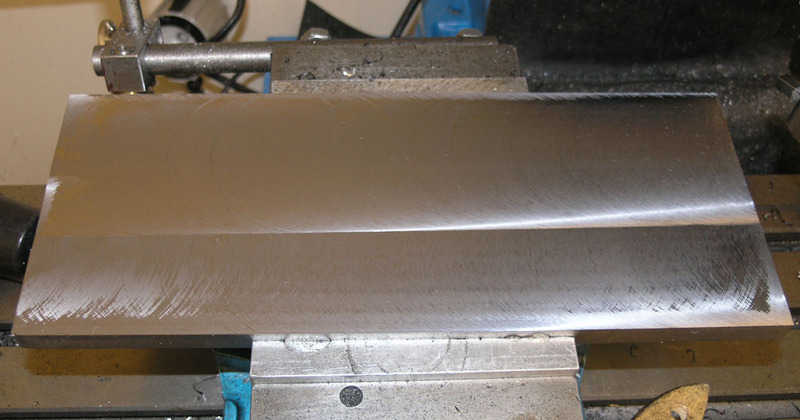 Since I was taking about .050 off in the first pass, the cut was stabilized by the amount of material I was taking off–all force was directed into that .050 thickness of metal coming off (almost all radial force and almost no axial force. 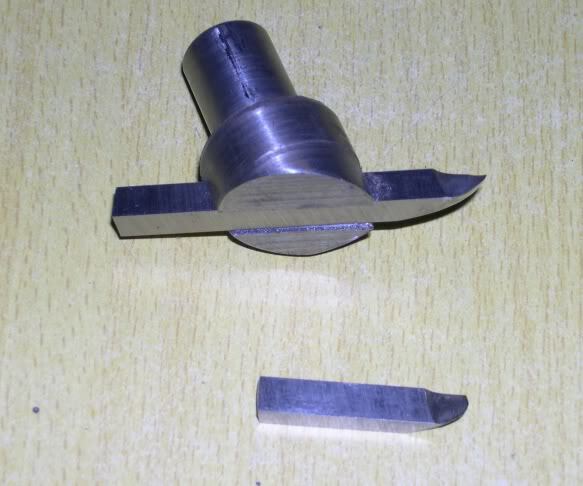 The cutter you are describing, due to the radius on the bottom, had forces pushing up against the tool(axial) as well as partially against the rotation of the tool (radial). 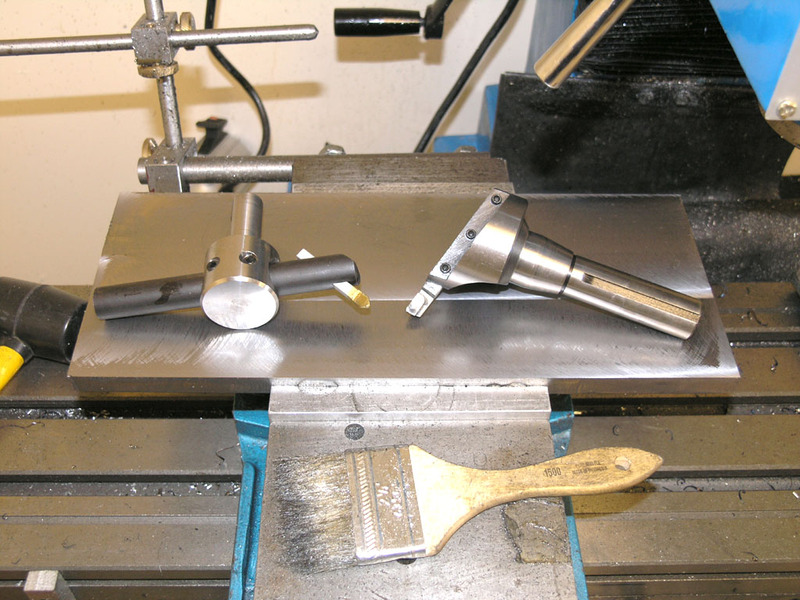 It takes a skilled machinist and toolmaker to understand hand ground cutters well enough to come up with that approach. Steve says there’s a lot of good content on CNCCookbook (thanks Steve!) but that we’re missing around 20% in his estimation. Every time I talk to someone like Steve I think there’s a lot more than 20% yet to be written about. We do appreciate all the kind folks like Steve who write in with helpful ideas or to share their projects.